A NASA video explains why "The World Didn't End Yesterday" ... more than a week before the date that's been hyped as a purported doomsday. NASA's latest video debunking doomsday hype comes from the future — to be precise, from Dec. 22, one day after the expected peak for worries that the end of an ancient Maya calendar cycle will signal the end of the world as well. Some might think that the video, titled "The World Didn't End Yesterday," was prematurely released. But it wasn't: The advance word about the non-apocalypse is a key part of the space agency's plan. "The teaser for the video explains everything: 'NASA is so confident that the world is not coming to an end on Dec. 21, that they have already released a video for the day after,'" Tony Phillips, the writer and editor behind the NASA Science website as well as SpaceWeather.com, told NBC News in an email. Phillips says the "day after" angle was his idea. "I felt it was a lighter and more creative way to approach the topic than some of the other treatments we've seen," he wrote. "Some people have been confused by it, but not all. The unorthodox approach is definitely a conversation-starter, which was our goal all along." 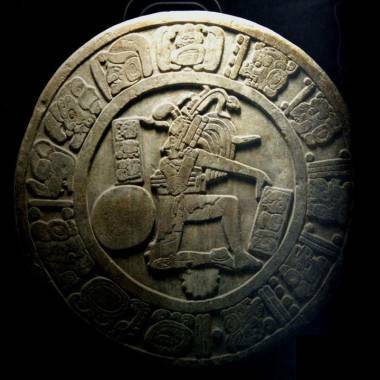 As the 12-21-12 date approaches, NASA has been taking the lead in telling people that the connection between the Maya calendar and doomsday fears is pure bunkum. By some accounts, a grand 5,125-year cycle comes to an end on Dec. 21, but this year, archaeologists found that the Maya calendar counting system goes beyond 2012, just as our own calendar recycles itself after Dec. 31. For what it's worth, there's even some question whether Dec. 21 is the right date for the Maya calendar turnover. The Maya "Long Count" calendar and its connection to 2012 has long been a topic of controversy. Along the way, the Maya hype has gotten mixed up with other end-of-the-world memes, ranging from monster solar storms to the onset of a threatening Planet X. There's a germ of truth behind some of the memes. For example, the sun really is heading toward the peak of its 11-year activity cycle, but solar maximum won't cause the end of the world. In fact, Phillips has said the upcoming solar max could be "the weakest of the Space Age." Meanwhile, our planet is indeed heading toward a rough alignment with the sun and the galactic center on Dec. 21 — but that alignment happens every year at this time, due to the winter solstice. NASA has been spending a lot of time lately separating the scientific fact from the scary fiction. Last month, the space agency put together a Web page that addresses the frequently asked questions about the 2012 hype, with links to even more information about topics ranging from polar shifts to supernovae and super volcanoes. This may sound like overkill, but it's not: Earlier this year, an international opinion survey conducted by Ipsos for Reuters found that 14 percent of the respondents believe the world will come to an end during their lifetime — and 10 percent said they were worried that the Maya calendar change-over would mark the end of the world. Take their fears seriously. Dismissing a fear with a quick "don't be silly comment" or brushing it aside by telling them not to worry is not going to help. If your children express a fear, take time to sit down and discuss it. This sends the message that you are really listening and that your kids can always come to you and they will be taken seriously. Educate yourself about the topic of their fears. This allows you to speak confidently about the subject and give you the facts when discussing a rumor. Help your child research the rumor. If your child heard the rumor at school or saw something scary on the Internet, sit down with him at the computer and help him to conduct his own research. Discuss the importance of finding credible sources for information and guide him to legitimate, authoritative resources. Take the fear off their plate. For younger children, sit down to discuss the child's fear and then tell them, "OK, from now on I will worry about this for you. You don’t have to worry about this anymore. I’ll look into it and I will let you know what I find out." Make sure to check back with your child once you have researched the topic. Anticipate any questions he may have and plan your responses. Do you still have concerns about Dec. 21? Are you hearing the Maya hype from your friends? How are you handling all this? Feel free to weigh in with your comments below, and check back next week for our continuing coverage of the doomsday buzz. In the meantime, review our coverage of last year's Rapture rigmarole to get an advance look at how this is all likely to go down. 2012 and the Maya: What were they thinking?